Professor George Zhao is a Professor with the School of Chemical Engineering at The University of Queensland and was recently awarded an ARC Australian Laureate Fellowship. Professor Zhao has previously been an ARC Future Fellow (2010–2014) and a UQ Vice-Chancellor’s Research and Teaching Fellow. Professor Zhao’s research focuses on nanoporous materials for energy and environmental applications. The overall objective of his research program is to develop tailor-designed advanced porous materials with prescribed structural, surface, and morphological properties for emerging applications. Professor Zhao’s research has been recognised by honours and awards, such as 2016 Thomson Reuters highly cited researcher, Fellow of The Royal Society of Chemistry (FRSC), and the Thousand Talent Professorship of the Chinese Government. George’s research focuses on novel porous materials for energy storage, photocatalytic water purification, and photonics. His current research projects include carbon-based materials as supercapacitor and Li-ion battery electrodes, porous photocatalysts for water disinfection and detoxification, self-assembly of microspheres for fabricating 3D colloidal photonic crystals and macroporous structures as sensors and waveguides. The overall objective of his research program is to develop tailor-designed nanoporous materials with prescribed structural, surface, and morphological properties for emerging applications and to update current technologies. While new materials have been of the main research activity, theoretical work has also been carried out to help understand experimental observations and phenomena. George specialises in designing advanced porous structures for electrochemical energy storage and conversion, heterogeneous catalysis, adsorption and separation of gas and liquid, immobilization of enzymes, and photonics. George has taught the following courses: Colloids and Surfaces, Chemical Reaction Engineering, Applied Heterogeneous Catalysis, and Materials Science and Engineering. Carbon-based materials for electrochemical energy storage and desalination, 2010-2014, funded by Australian Research Council (ARC). Advanced porous materials for emerging applications, 2011-2015, funded by The University of Queensland. Charge storage mechanism and transport behaviour in nanoporous carbons: implications on developing next-generation electric double-layer capacitors, 2013-2015. Funded by ARC. Porous materials such as zeolites and activated carbon have been used in many technological fields, such as petroleum refining, gas separation and purification, wastewater treatment, and so on. Emerging applications require a high level of control over porous materials with well-defined physical and chemical properties. Our research interests focus on design and preparatino of nanoporous materials for electrochemical energy storage (batteries and supercapacitors), water purification, electrocapacitive desalination, natural gas conversion, and photonics. Currently we work on porous carbon-based materials as supercapacitor and Li-ion battery electrodes, graphene and titanium dioxide materials for water disinfection and detoxification, self-assembly of microspheres for fabricating 3D colloidal photonic crystals, hierarchical zeolite materials as heterogeneous catalysts, and immobilization of enzymes on porous solids. The overall objective of his research program is to develop tailor-designed novel porous materials with prescribed structural, interfacial, and morphological properties for emerging applications. While new materials have been of our main research them, computational work has also been carried out in our lab to simulate and model important physical phenomena that would not be easy to observe experimentally or those cannot be completely understood experimentally. Zhang, J. and Zhao, X. S. (2014). Graphene-based materials for electrochemical energy storage. In Wu Yihong, Shen Zexiang and Yu Ting (Ed. ), Two-dimensional carbon: fundamental properties, synthesis, characterisation and applications (pp. 183-246) Boca Raton, FL, United States: Pan Stanford Publishing. Yu, Jianqiang, Zhang, Yan, Yu, Deshuang, Zhou, Xiaochen and Zhao, X. S. (2010). Photocatalytic and photoelectrochemical properties of visible-light driven aurivillius structured materials. In Geri K Castello (Ed. ), Handbook of photocatalysts: Preparation, structure and applications (pp. 385-408) New York United States: Nova Science Publishers. Su, Fabing, Zhou, Zuocheng, Guo, Wanping, Liu, Jiajia, Tian, Xiao Ning and Zhao, X.S. (2008). Template approaches to the synthesis of porous carbon. In Ljubisa R. Radovic (Ed. ), Chemistry and Physics of Carbon (pp. 63-128) U. S. A.: CRC Press. Zhou, Z. C. and Zhao, X. S. (2004). 3D macroporous photonic materials templated by self assembled colloidal spheres. In G. Q. Lu and X. S. Zhao (Ed. ), Nanoporous Materials: Science and Engineering (pp. 206-236) Covent Garden, London, United Kingdom: Imperial College Press. Zheng, J., Song, C., Xu, X., Turaga, U. T. and Zhao, X. S. (2004). Acidity measurement of nanoporous aluminosilicates: zeolites and MCM-41. In G. Q. Lu and X. S. Zhao (Ed. ), Nanoporous Materials: Science and Engineering (pp. 464-486) Covent Garden, London, United Kingdom: Imperial College Press. Wang, Baoyan, Guo, Peizhi, Bi, Huaqing, Li, Qun, Zhang, Guoliang, Wang, Rongyue, Liu, Jingquan and Zhao, X. S. (2013) Electrocapacitive Properties of MnFe2O4 Electrodes in Aqueous LiNO3 Electrolyte with Surfactants. International Journal of Electrochemical Science, 8 7: 8966-8977. Wan, Yong, Zhao, Xiu-Song, Cai, Zhong-Yu, Li, Hong-Liang and Xia, Lin-Hua (2011) Fabrication of binary colloidal crystals with PS microspheres and other complex structures by horizontal deposition method. Rengong Jingti Xuebao/Journal of Synthetic Crystals, 40 5: 1295-1298. Wei, Zhong-Bin, Cui, Yu-Qian, Guo, Pei-Zhi, Gu, Yi, Zhang, Guo-Liang and Zhao, Xiu-Song (2011) Hydrothermal synthesis and characterization of Ceria octahedrons. Chinese Journal of Inorganic Chemistry, 27 7: 1399-1404. Wan, Yong, Cai, Zhong-Yu, Zhao, Xiu-Song, Li, Hong-Liang and Xia, Lin-Hua (2011) Effect factors in the preparation of silica spheres by two-step method. Gongneng Cailiao/Journal of Functional Materials, 42 4: 734-736. Wan, Yong, Cai, Zhong-Yu, Zhao, Xiu-Song, Li, Hong-Liang and Xia, Lin-Hua (2011) Fabrication and characterization of PS colloid crystals and SiO2 inverse structures. Rengong Jingti Xuebao/Journal of Synthetic Crystals, 40 1: . Zhang Yan, Yu Jian-Qiang, Gao Xing-Long, Sun Hong, Guo Pei-Zhi, Li Hong-Liang and Zhao Xiu-Song (2011) Preparation and photoelectrochemical property of a novel visible-light photovoltaic material NiNb2O6. Chinese Journal of Inorganic Chemistry, 27 1: 141-144. Zhao Jun-Hua, Li Hong-Liang, Lin Qing, Li Ke-Xun, Peng Zhi and Zhao Xiu-Song (2010) Mesoporous carbon preparation by in-situ carbonization via a reaction under autogenic pressure at elevated temperature. Chemical Journal of Chinese Universities-Chinese, 31 6: 1088-1092. Zhao, D., Tan, J. S., Ji, Q. Q., Zhang, J. T., Zhao, X. S. and Guo, P. Z. (2010) Mn(2)O(3) nanomaterials: Facile synthesis and electrochemical properties. Chinese Journal of Inorganic Chemistry [Wuji Huaxue Xuebao], 26 5: 832-838. Zhang, Lin, Zhai, Jiang, Li, Ke-Xun, Zhao, Jun-Hua, Li, Hong-Liang, Wan, Yong and Zhao, Xiu-Song (2009) Electrolyte effect of CaCl2 in the preparation of silica spheres. Gongneng Cailiao/Journal of Functional Materials, 40 10: 1656-1659. Guo, Pei-Zhi, Tan, Jin-Shan, Ji, Qian-Qian, Zhao, Dan and Zhao, Xiu-Song (2009) beta-FeOOH nanospindles: Facile synthesis and their transition to alpha-Fe2O3 submicron/micro-particles. Chinese Journal of Inorganic Chemistry, 25 4: 647-651. Li, Hong-Liang, Zhai, Jiang, Wan, Yong, Guo, Pei-Zhi, Yu, Jian-Qiang and Zhao, Xiu-Song (2008) Preparation of the oxidized porous silicon with stable surface composition and intense photoluminescence. Chinese Journal of Luminescence, 29 5: 879-884. Li, Hongliang, Guo, Peizhi, Yu, Jianqiang, Han, Guangting and Zhao, Xiusong (2008) The influence of complexes' configuration, ligand's properties and trans-effect on the acid-catalyzed reaction mechanisms of trans-Ru(py) 4(NO2)2, trans-Ru(bpy)2(NO 2)2 and cis-Ru(bpy)2(NO2) 2. Chemistry Bulletin / Huaxue Tongbao, 71 7: 533-538. Guo, Pei-Zhi, Li, Hong-Liang, Yu, Jian-Qiang, Sun, Hong and Zhao, Xiu-Song (2008) Hydrothermal synthesis and characterization of hexagonal gamma-MnS single crystal nanorods in presence of biomolecule L-cysteine. Chinese Journal of Inorganic Chemistry, 24 9: 1387-1392. Zhang, Yan, Yu, Jianqiang, Kudo, Akihiko and Zhao, Xiusong (2008) Preparation of BiVO4-MCM-41 composite catalyst and its photocatalytic activity for degradation of methylene blue. Chinese Journal of Catalysis, 29 7: 624-628. Guo Peizhi, Liu Minghua and Zhao Xiusong (2008) Studies of chiroptical switch. Progress in Chemistry, 20 5: 644-649. Zhao, Xiu-Song (赵修松), Li, Hong-Yuan (李宏愿) and Wang, Qing-Xia (王清遐) (1994) Synthesis and characterization of large crystals of aluminophosphate molecular sieve AlPO(4)-5. Chinese Science Bulletin, 39 16: 1403-1406. Zhao, George (2011). Graphene-based electrode materials for supercapacitors applications. In: Advanced Electrochemical Energy Symposium, Hong Kong University of Science and Technology, (). 28-30 December 2011. 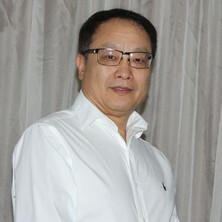 X S Zhao (2010). Advanced materials for energy and environmental applications. In: The 9th China International Conference of Nanoscience and Nanotechnology, Xi'an, China, (). 15-19 November 2010. Nalaparaju, Anjaiah, Zhao, George X. S. and Jiang, Jianwen (2008). Cation redistribution upon water adsorption in titanosilicate ETS-10. In: Qing Li, S. Y. Chen, Anping Xu and Ming Li, Recent advance in systems, communications and computers: Selected Papers from the WSEAS Conferences 2008. 7th WSEAS International Conference on Applied Computer and Applied Computational Science (ACACOS '08), Hangzhou, Peoples Republic of China, (204-208). 6 - 8 April 2008. Yan, Q. F., Zhou, Z. C., Su, F. B. and Zhao, X. S. (2007). Defect engineering in self-assembled 3D photonic crystals. In: Nanoscience and technology. China International Conference on Nanoscience and Technology (ChinaNANO 2005), Beijing, People's Republic of China, (377-380). 09-11 June 2005. Zhou, Zuocheng, Li, Qin, Wang, Likui and Zhao, Xiusong (2006). The effects of surfactants on the morphology of colloidal crystals in self-assembly. In: , , (82-89). .
Erokhin, Sergey G., Boriskina, Yulia V., Granovsky, Alexander B., Vinogradov, Alexey P., Zhao, X. S. and Inoue, Mitsuteru (2005). Magnetorefractive effect in magnetophotonic crystals. In: Magneto-Optical Materials for Photonics and Recording. Magneto-Optical Materials for Photonics and Recording, , , (115-120). November 29, 2004-December 2, 2004. Zhao, X. S., Zhou, Z. C., Chong, M., Bao, X. Y., Su, F. B., Guo, W. P., Yan, Q. F. and Lu, L. (2005). Template approaches to fabrication of novel porous materials for emerging applications. In: Australia-China Materials Science Symposium, Brisbane, QLD, Australia, (20-24). 22 - 25 October 2004. Zhao, X. S., Lu, G. and Hu, X. (1999). Adsorption study on modified MCM-41 materials. In: The Fifth IUMRS International Conference on Advanced Materials. IUMRS-ICAM '99, Beijing, China, (II51). 13-18 June. Zhao, X. S. and Lu, G. (1999). Pore-month engineering of MCM-41 materials: a preliminary study. In: 5th International Symposium on the Characterisation of Porous Solids. COPS-V, Heidelbery, Germany, (218-218). 30 May - 2 Jun 1999. Synthesis, Modification, Characterization, and Application of MCM-41 for VOC Control. Zhao, Xiusong (1999). Synthesis, Modification, Characterization, and Application of MCM-41 for VOC Control. PhD Thesis, , University of Queensland. Synthesis of semiconductor nano-particles within the channels of mesostructured silica using a guest-host encapsulation method.